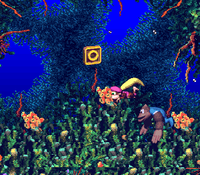 Bazza's Blockade is the eleventh level in Donkey Kong Country 3: Dixie Kong's Double Trouble! It is also the first area of Cotton-Top Cove. As this water level's name suggests, it is filled with many Bazzas, making their first and only appearance in the original version of the game. 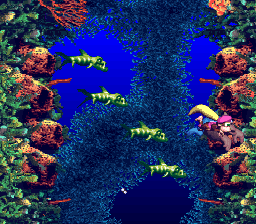 These green barracuda enemies can be found all over the level, serving as the Kongs' main obstacle for the level. The foes travel out of small holes on the outside of areas, much like Swoopies, and try to dive into both Dixie and Kiddy Kong. Because of this, the apes have to be careful when they pass a school of Bazzas. Kocos also appear here, as do Lurchins, though only in a Bonus Area. Enguarde is playable throughout the later half of this level as well, and he can be used to defeat the first Bounty Bass in the game. At the beginning of the level, the Kongs swim out of a cave and down towards a DK Barrel and a school of Bazzas traveling across a wide area. The letter K is in the uppermost part of this area. Soon, the apes travel north past a Koco and to another group of Bazzas that swim over two Banana Bunches. They can find more Kocos in their path as they travel through a thin, curvy passage. Eventually, the path leads them south towards some more groups of Bazzas. The second group swims over a small alcove that contains a Bonus Barrel. There are more schools of Bazzas as the Kongs continue up the path to the north. This time, each row of Bazzas is close together. Soon, the primates find a slightly wider path leading east, with one row of Bazzas swimming across it. After they dodge these barracuda enemies, they encounter some Kocos and the letter O. A thin, U-shaped passage follows here, and a Star Barrel is at the bottom of it. Bazzas also swim across this curved pathway. Once the Kongs pass the foes, they continue up to a DK Barrel and more rows of Bazzas, some of which that are close together. A much thinner path leading to the east is at the top of this area, and Bazzas travel through it. If the Kongs survive this potion of the level, they head south through an area containing a few more schools of Bazzas. An additional school is ahead, just before a pathway to the north that leads past two more rows of Bazzas and to another thin passage. Another group of Bazzas swims through the thin passage, which can lead the Kongs to the left or right. If they head left, they can find a wider area with a Bonus Barrel, but if they travel right, they can progress farther into the level, where there is another wide area that contains a few Kocos, the letter N, and an Animal Barrel containing Enguarde. If the apes swim east from here, they reach a pathway leading downwards. The pathway consists of four more Bazza schools and a DK Barrel. Farther ahead of here, the Kongs can find some Bazzas that swim through their path. If they are dodged, the Kongs access a wide area that holds a single Bounty Bass, who Enguarde can defeat to earn a Bear Coin. After the apes pass more Bazzas as they head to the south, they pass a No Animal Sign. If they pass the sign with Enguarde, the Animal Friend disappears and they are given the letter G. The entrance to a cave is nearby. Inside the cave, they can find the Level Flag and a Koin. K: The K floats above the first school of Bazzas. O: The letter O is shortly before the Star Barrel in an area containing a few Kocos. 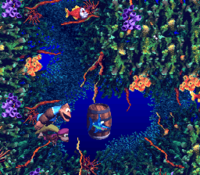 N: The Kongs can find the letter N near an Animal Barrel, which is found not too far from the second Bonus Barrel. G: The Kongs earn the letter G if they manage to lead Enguarde to the No Animal Sign at the end of the level. Not too long after the letter K, the apes can find a school of Bazzas swimming across the top of a large alcove. They should swim below them to find a Bonus Barrel, which, upon being entered, leads them into a Bonus Level. There, the Kongs need to swim through a narrow passage, dodging several Bazzas and a Lurchin on the way. If they manage to reach the end of the area before the time limit of 15 seconds runs out, they can find a Bonus Coin to collect within the remaining time. Shortly after passing the level's Star Barrel, the Kongs can find a narrow passage to their left and right. The path to the left leads to a wider area with a Bonus Barrel, which sends the Kongs to a Bonus Barrel when entered. There, they need to turn into Enguarde and defeat several Kocos swimming out of small holes. Once all the Kocos are defeated within 30 seconds, a Bonus Coin appears the to top of the area. After exiting this bonus, the player is able to play as Enguarde until he passes the No Enguarde sign. At the end of the level, the Kongs can find the Koin to the right of the flagpole. He is in possession of the DK Coin, but will not give it up without a fight. To get the coin, the Kongs need to defeat him with the nearby Steel Keg. This can be done by throwing the keg at the nearest wall when the Koin is facing away from it, thus keeping the enemy from deflecting it with its shield. Once it is defeated, they can collect the coin. Koin is located at the end of the level. This page was last edited on April 6, 2019, at 13:01.